Beautiful hand-rolled truffles are an occasional treat at Theo's Fremont factory shop. People tend to think of chocolates specifically around Valentine’s Day—and any other day we want to shower our loved ones with sweets. But we believe Seattle’s chocolate scene is too prolific to only enjoy once a year, and too good to only buy for others. Treat yourself, or buy something special, at one of our favorite local chocolate shops. Seattle’s own version of Willy Wonka—with less nightmare-inducing sweets and more organic goodies—is located in an old brick building in Fremont, where the smell of chocolate brewing wafts for blocks. Theo's daily tours are a delight, but swing by the gift shop any old time for some special treats—creative truffles, cocoa nibs, a great take on a moon pie—that you can’t find in grocery stores. The newcomer, kind of, to Seattle’s chocolate scene is Bakery Nouveau owner William Leaman. 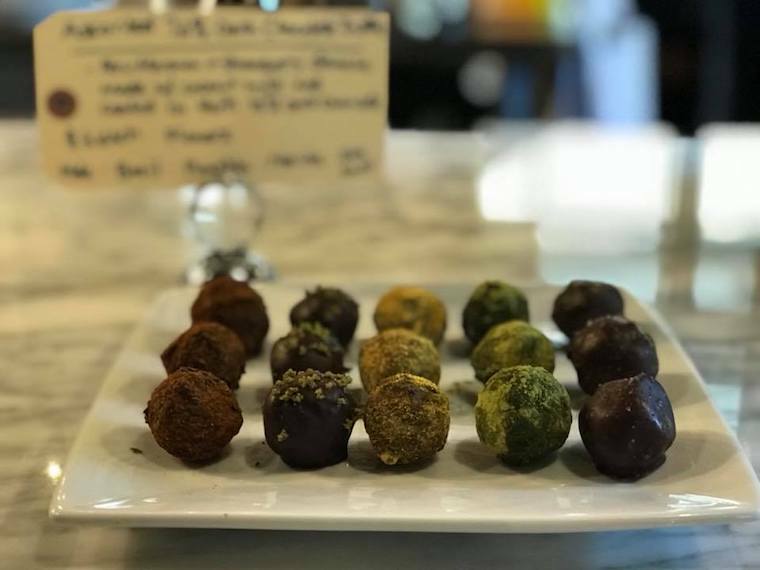 The talented pastry chef has been making a small assortment of beautiful truffles and magnificent seasonal chocolates for years, but the new Burien shop has given him something he’s always wanted: a dedicated, temperature-controlled space to play with chocolate. Swing by the bakery and peep the master through the glass panel in the floor, then pick up one of the new bean-to-bar chocolate bars. This darling artisanal chocolate shop moved into a jewel-box of a location in Pike Place Market’s MarketFront expansion last summer, making it a charming destination for tourists and locals alike. Single-origin dark chocolate is the specialty—a sophisticated, grownup chocolate that should be in an entirely separate food category from Hershey’s. But there’s more to buy here than bars: look for chocolate lotion and lip balm, handmade marshmallows, teas and spices, and beautiful gift sets that combine all these. Classes, too, are available for the budding chocolatier. There are enough coffeehouses and chocolate shops in the greater Seattle area that it’s hard to come up with a new idea for either, yet Dote owner (and longtime coffee professional) Sarah Doud and Swiss chocolatier Ewald Notter have managed to make Dote feel unique. The new Bellevue café, located inside the Bellevue Collection’s Lincoln South Food Hall, specializes in beverages and desserts where coffee and chocolate intersect: lattes made with Notter’s now-famous ganaches, affogatos, boozy/buzzy cocktails, chocolate-covered beans. You’ll want to get a coffee to enjoy, but there’s plenty to take home as a gift (for yourself or someone else). Aaron Barthel says he wanted to be a mad scientist when he grew up. That dream nearly led him to a career as a botanist, until he spotted a recipe for chocolate ganache truffles in a botany magazine his mom had sent him. Now this Pioneer Square–based child of Minnesota dairy farmers is whipping up maddeningly good truffle bars, ingeniously infused with plant-world superstars such as organic basil, bay leaves, añejo tequila with fresh lime zest, and black tea with fresh sage. You can visit the retail tasting bar at 157 S Jackson St. or make an appointment at Barthel’s kitchen space, where, by appointment, he’ll teach you the scientific approach to a total chocolate geek-out. Intrigue will also be opening a Capitol Hill coffee-and-chocolate shop this year. From the pointillist truffle mosaic on one wall (a portrait of owner Fran Bigelow’s granddaughter) to the line of eager tourists at the counter, Fran’s Chocolates’ flagship store in the Four Seasons Hotel, just south of Pike Place Market, is Seattle’s classiest chocolate spot, an elegant, cream-colored reflection of the time Bigelow spent chasing chocolate in Paris. No matter which color ribbon Fran’s is using to wrap her signature chocolate-colored boxes, the swish shopping experience makes one feel gifted—which Bigelow says is her ultimate goal, as if bringing out the true flavor of chocolate isn’t enough. No wonder she’s been in town for more than 30 years. Like Theo and Fran’s, you’ve likely seen these whimsical, colorfully packaged chocolates in your local store’s candy aisle. But in early 2017, they opened their Tukwila factory to tours, adding another layer of fun for chocoholics. In addition to tours, the shop also offers fun special events like classes, pop-ups and popular seconds sales for slightly less than perfect chocolates. It’s also the place to pick up their upscale jcoco line of creative chocolates (think black fig pistachio or cayenne Veracruz orange). Chocolat Vitale was selling hot chocolate mixes wholesale for years before owner Janet Eicher opened her in NE Ballard in 2011. Like a well-traveled living room with too many armchairs, it’s a browser’s paradise, with chocolate from around the globe, of course, and also an eclectic mix of retro furniture, vintage dishware and—our favorite—a bubble gum machine that dispenses a big handful of rich dark-chocolate-covered pistachios when you plunk in 50 cents. Don’t miss the Venezuelan dark hot chocolate, made by request from Vitale’s well-loved mix, also available for sale at the shop.